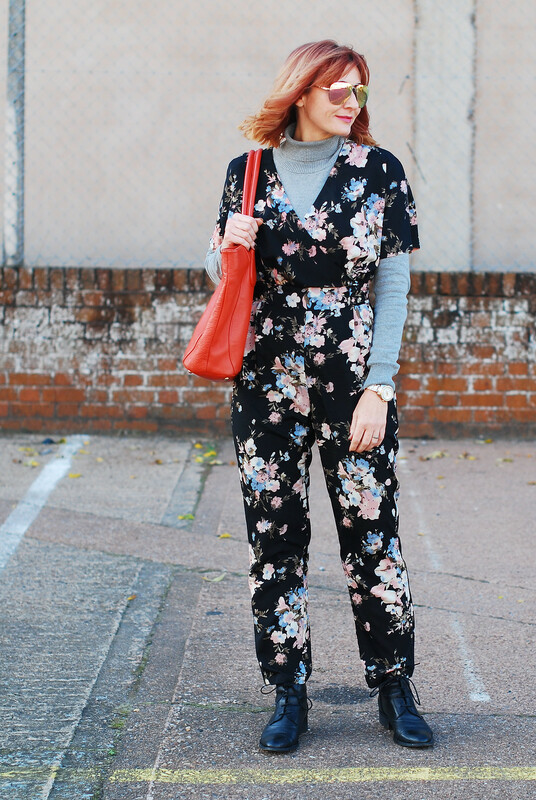 Continuing my theme of getting the most out of your summer clothes as autumn settles in, I wore a floral jumpsuit in very cold weather this week. 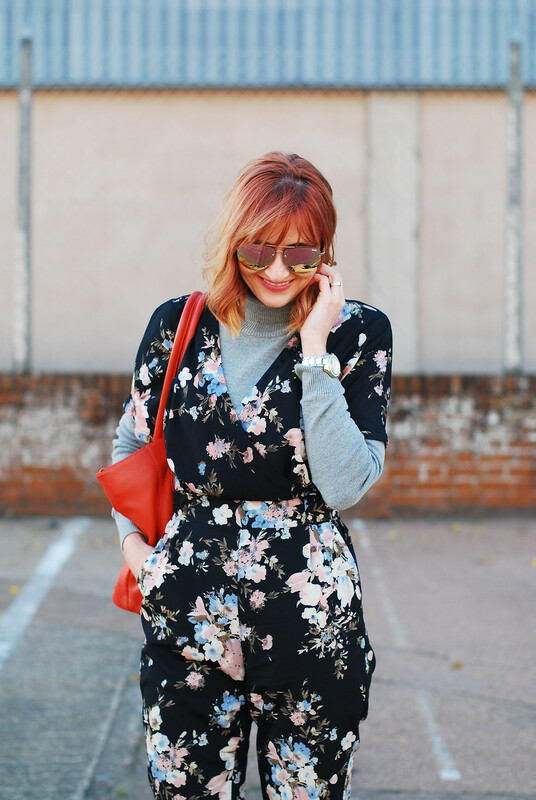 Now a floral jumpsuit may not seem like a particularly versatile piece – especially when it comes to colder weather – but the beauty of this one I got from ASOS is that it has a dark background, and dark florals always work in autumn and winter: You simply layer up and you’re good to go. I added a ribbed grey roll neck (similar) that I got last winter, and you can’t see but I was also wearing tights underneath my jumpsuit. I know that some people can’t wear tights at all, and some absolutely can’t wear them under trousers, but I absolutely can – and have to – when it’s really cold…! I WAS ALMOST OUT THE DOOR WHEN I REALISED THAT UNZIPPING THE JUMPSUIT AND GETTING THROUGH ALL THE LAYERS TO GO TO THE BATHROOM MIGHT BE A BIT OF A NIGHTMARE. The only problem I encountered (and those of you who’ve ever grappled with a jumpsuit may know what’s coming) is that I wore this when travelling up on the train to London. I was almost out the door when I realised that unzipping the jumpsuit and getting through all the layers to go to the bathroom might be a bit of a nightmare, but it was too late to change into something else. 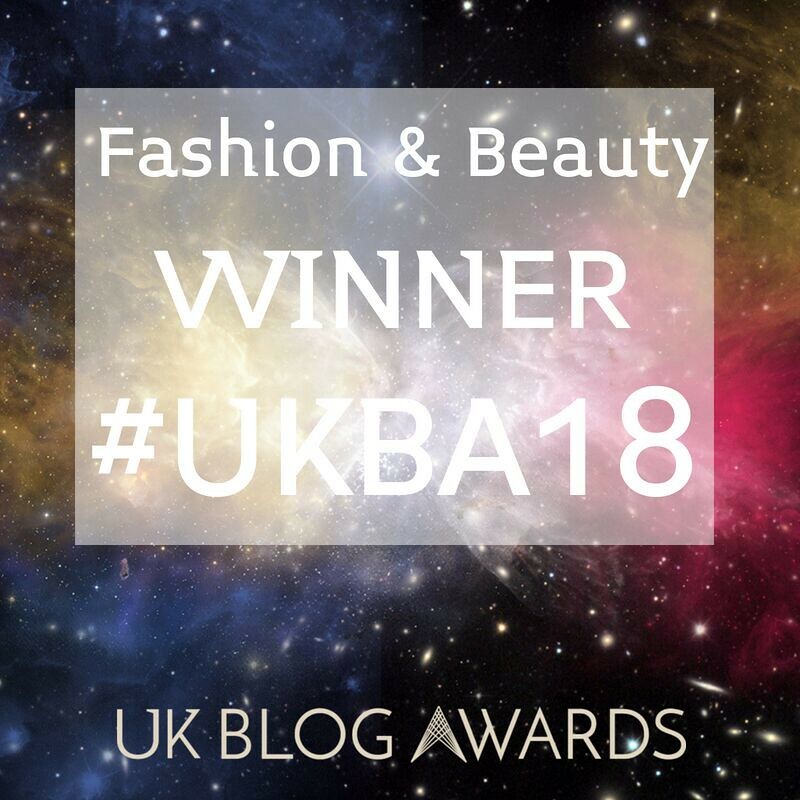 However, apart from it taking an awfully long time to practically undress to nothing (thank goodness for the roll neck), going, and then getting dressed again it actually wasn’t too much of a problem. I think I was just excited about finding a way to style florals in winter temperatures that I forgot to think about the practicalities. The finishing touches were practical, however: Mirrored aviators to prevent squinting on the train (it’s somehow always blindingly sunny on train journeys for me and my reserved seat is always on the sunny side), my trusty orange tote (similar) and comfy worker boots (similar) for a day trudging round London. In case you were wondering, I did wear a wool coat due to the sudden drop in temperatures but I’ll show you that in another outfit post next week (it’s the grey Mark & Spencer coat I featured in my amazing M&S things to buy post). Yes, I braved biting cold winds without a coat to bring you the jumpsuit outfit in all its glory…! 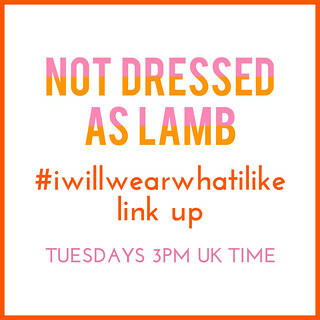 Scroll down for all the #iwillwearwhatilike details – add your outfits to this week’s link up and if you’ve added a link to here or my button to your post you may be featured next week! DO YOU EVER WEAR DARK FLORALS (OR JUST FLORALS) IN THE AUTUMN/WINTER? 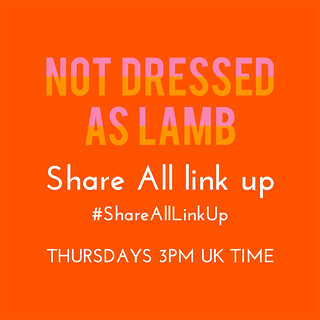 TELL ME HOW YOU STYLE THEM IN THE COMMENTS OR TWEET ME @NOTLAMB! Love the dark florals and layering Catherine! Such a pretty look! I want to find a jumpsuit that is long enough! It is getting cold over here in Southern Spain … although I'm sure not as cold as it is where you are. 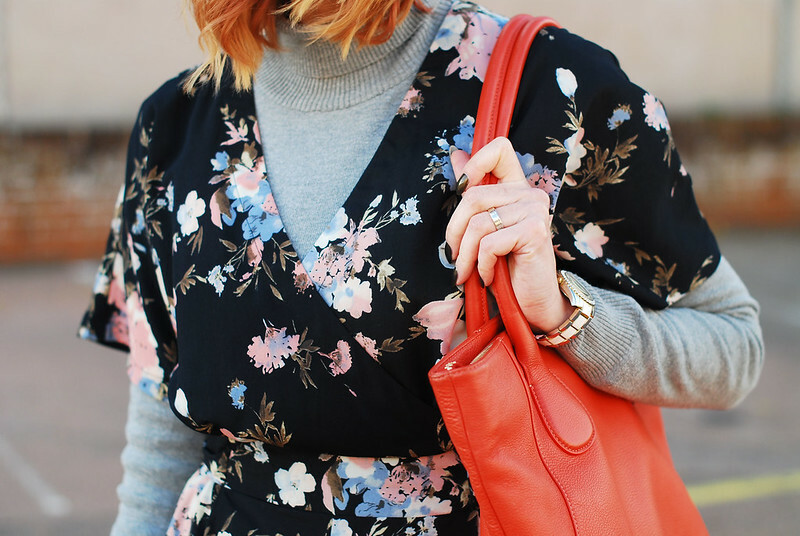 My latest post is about a dark floral dress that I paired with tights and boots, in fact! I find if it's darker, go for it! Exactly, why to put such a nice peace as this jumpsuit to the bottom of the wardrobe just because is colder. Perfect! I love jumpsuits! I have a floral one too that I want to wear for fall and winter! I think the layering tip does the trick! Thank you~! I've been a bit sceptical about a jumpsuit, (due to toilet issues!) but am slowly coming round to the idea. As for the floral I'm definately for winter floral, they tend towards larger prints and are definately in darker colours. Love your pop of colour with the orange bag, it lifts your outfit to the next level. I love how elegant this piece is and actually it even seems like it could be pretty versatile! Gorgeous Catherine. 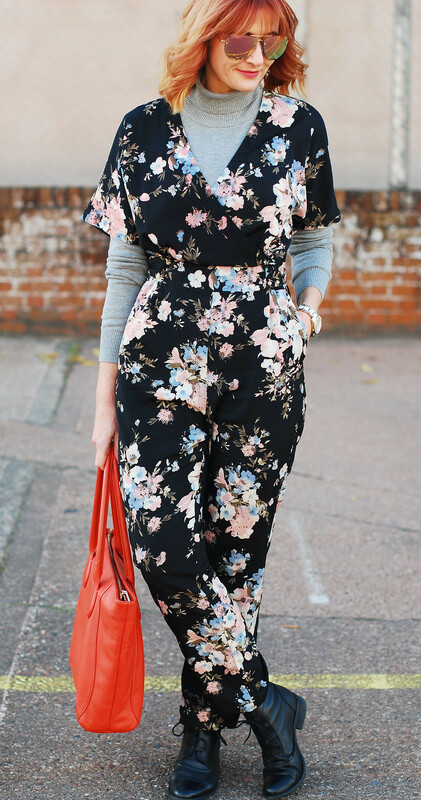 Love the jumpsuit and how you styled it. That is a stylish way to layer your jumpsuit! The shape of that pantsuit is really great. I like the tapered legs. I would be inclines to try one again with pantalets like that. I had one with wide legs, but I immediately got rid of all of my Palazzo-style trousers after one pair sent me sprawling all over the floor of the Toronto airport. SUPER embarrassing, and I had to rehab my knee for 2 months! That is clever styling. I really like it. I haven't got many patterns or florals in my wardrobe. Funny thing to come to such conclusion. Like the time when you had the I will wear what I like challenge with 4 colours and I found out I never use more than three. Conservative hello. Aside from the bathroom issue this outfit is wonderful. I will also sometimes wear tights under pants as an extra layer. I don't like to freeze but then as soon as you head indoors you die from heat. There is no winning. Catherine I love this winterising of a jumpsuit and am with you on a roll neck with functional boots, but am completely not with you regarding tights under trousers! Samantha also talks about tights as an extra layer, but I just can't abide that rubbing and catching sensation that seems to happen to (maybe just) me. Ah well, there's nowt as queer as fowk, as they say! Thanks for the link up party and the chance to make some new friends. Love how you layered this jumpsuit for a perfect transition piece! So beautiful! Love how you layered and transitioned this into a fall friendly look! Great styling tips. SUPER cute and a great idea. I do love to make my wardrobe work for me and you have done it here. Since I have the bladder of a small child, that might annoy me! hehe. Regardless, the jumpsuit is beautiful on you, i love the soft blue and pink flowers in this jumpsuit Catherine! I have been thinking of ways to wear my spring dresses with layers, and I love the grey turtleneck you chose with these pastels. Your hair styled wavy looks very pretty as well. What better than flowers when the weather gets colder. Oh Sacramento I'm glad (for your sake) that it's getting cooler – though I wouldn't wish the temperatures we have here on you…!! Thanks Susan! I know the feeling about certain types of clothing that just don't fit you properly – I have a large waist-to hip ratio and trying to find trousers that fit me without gaping at the waist is a nightmare!! 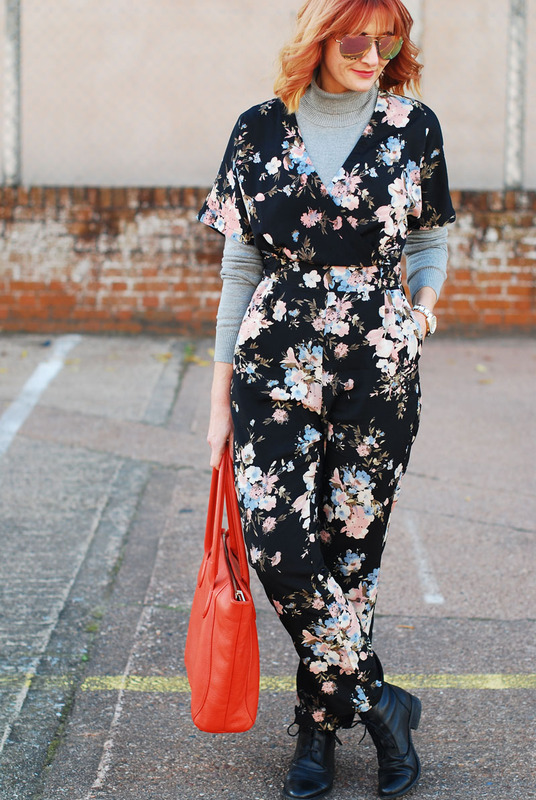 That is a clever way to style a jumpsuit for autumn. And yes, I love to wear dark florals in autumn and winter. 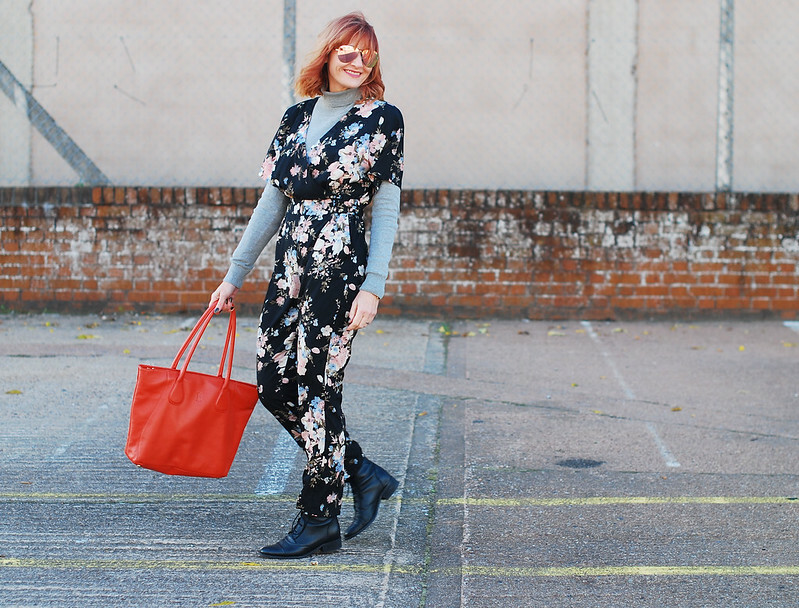 Thank you Amy… Dark florals suit cold weather better than hot weather, don't they?! 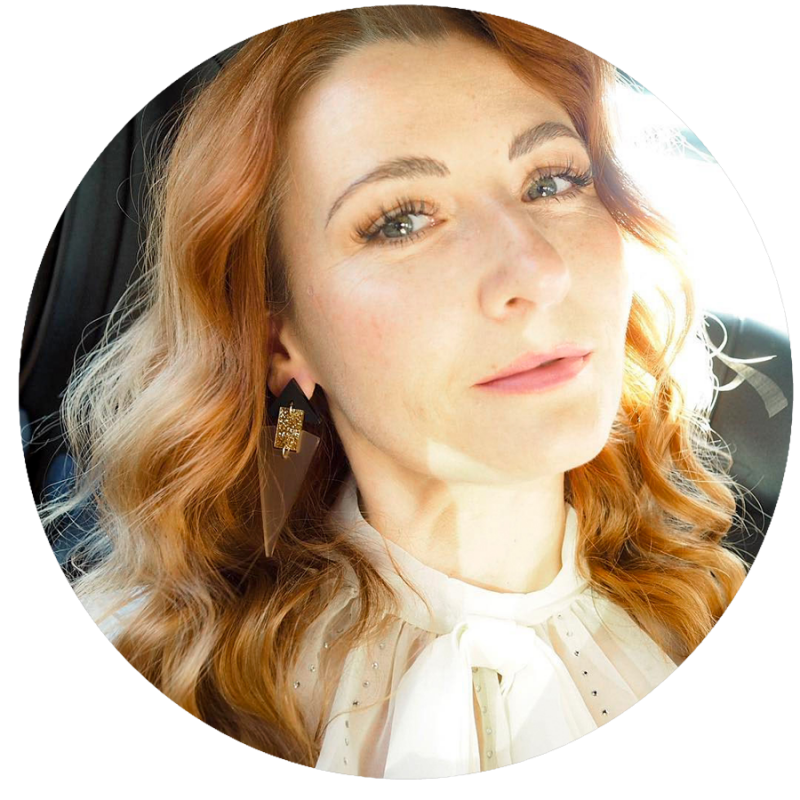 It's true that there is some extra work to go to the bathroom in a jumpsuit, but half the time you basically need to reconfigure your outfit anyways! Even if it's a dress or trousers!! Besides, it's definitely easier to add a turtleneck like this, than a jacket over top! I love making your clothing versatile, like you've done!! It's not only economical, but very smart!